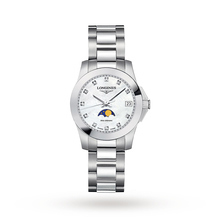 Making full use of the heritage and engineering prowess that Longines have perfected over the last 180 years this Longines Conquest Ladies Watch is as striking and bold as it is well made. Featuring a mother of pearl dial, unpretentious silver hands and date window housed in scratch resistant sapphire crystal this excellent example of traditional craftsmanship and finesse is bought up to date using modern materials. Complimented by a 29.5 mm stainless steel case with matching bracelet.